Auctioned on eBay in July 2014 to help Le Rocquier School Paris to Jersey Cycle Challenge Team raise £21,000 for the Stroke Association. The auction has now finished but you can read the press release about it below. An original artwork commemorating the 1910 Tour de France winner and First World War fighter pilot, Octave Lapize, is to be auctioned for charity. 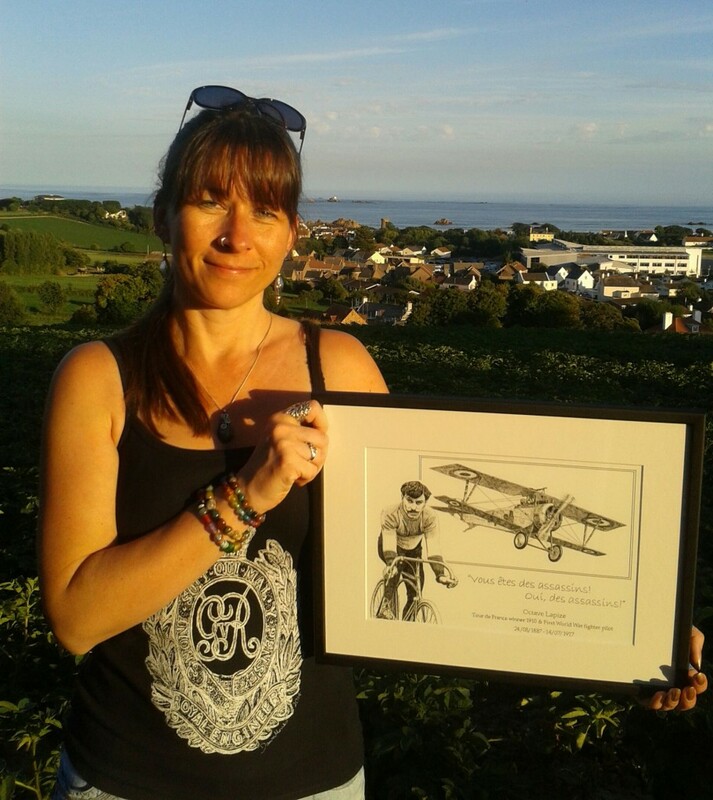 Jersey military artist and illustrator, Dawn Monks, decided to combine her love of ‘Le Tour’ with her interest in military history in order to create a unique, one off piece of work in pen & ink that will be sold on eBay, with all of the proceeds going to the Stroke Association. The 1910 Tour de France was the first to include the steep climb of the Col du Tourmalet as part of the race route, along with three other mountains. Tackling these difficult ascents on a single speed bike, up rough tracks that were very far removed from the smooth tarmac of the Tour of today, must have been gruelling to say the least. Lapize had the reputation of being the best mountain climber alive, but he was so incensed by the ordeal the organisers were inflicting on the cyclists that every time he passed a race official on the climb he yelled, ‘Vous êtes des assassins! Oui, des assassins!’ (‘You are murderers! Yes, murderers!’). Donations can be made to the Le Rocquier School Cycle Challenge team by visiting their JustGiving page.